We are proud to announce that Prairie’s Johnson Athletic Center Fitness Center was recently awarded the Strength of America Award. 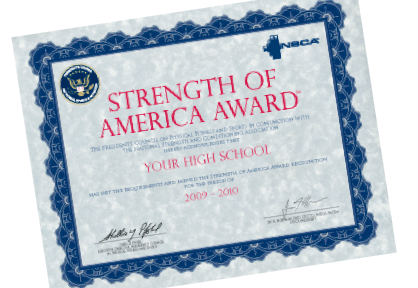 Presented by the National Strength and Conditioning Association (NSCA), and the President’s Council on Fitness, Sport and Nutrition Program (PCFSNP), the award is given to high schools who have demonstrated excellence in the implementation of safe and effective strength and conditioning programs. The award is based on a score that indicates how well a high school compares to what the President’s Council on Fitness, Sports & Nutrition and the NSCA consider to be the gold standard in high school strength and conditioning programs. The actual score is determined by achieving and maintaining excellence in the major components of supervision, education, program design, and facilities. Experience the Fitness Center for yourself! Summer Offerings: The center is open to current families, students, faculty/staff and alumni. Stay tuned for more information. We hope you take the opportunity to check out the website and utilize the fitness center this summer! This entry was posted in All News, Athletics, Featured, Fitness Center by Communications Department. Bookmark the permalink.